For some reason it was absolutely impossible to find fast-drying pants the week before I left. Everything was sold out during the summer sale. I was forced to pack the thinnest cotton pants I could find instead. This worked since we had fairly nice weather with no rain, but I would definetely not recommend it since the pants took a long time to dry and I needed to pack several pairs of pants. In the worst case however, they could always have hiked in their merino long-johns and rain clothes. Rain clothes by the way is probably the most important piece of kit. I found very light jackets at Decathlon in France. We had such good weather however that they were not put to the test on this trip. As pants we used the kids normal rubberized pants. More so than the jackets, the pants really get a beating, so I'm a bit hesitant to try light pants. The concept of hard wearing shell pants could perhaps be interesting, but they can be a bit pricey and in addition to that I'm afraid the kids will sweat too much in them if they would wear them all the time. I know I do. A part from finding good pants I found that the biggest problem was finding good sleeping bags. Most children sleeping bags are not made for temperatures as cold as around zero degrees. There are expensive alternatives for sure, but since the kids are growing fast I find it a bit waste of money. In the end I opted to use their normal toy +5-10C bags and complement with another +10C bag on top of them. A big problem with this approach however was the bulk and to a lesser extent weight. Keeping the third bag on top of the kids was also a major problem. Although this system kept us warm and alive I'm not satisfied. Next time I will probably try the winter overall system and/or make/buy proper warm sleeping bags for the kids. One thing you quickly notice when you pack for any trip with small children is that you need a lot of space. They cannot carry all their belongings, so you will have to pack most of the kids stuff. The Gossamer Gear Mariposa Plus really is very handy for this purpose since it is very voluminous without much of a weight penalty. The outside mesh pockets are also very handy for drying clothing and quickly stuffing items (it seems you are always busy packing and unpacking stuff for the kids.). The kids can however carry some things themselves. Of course, out of principle, I wanted them to have ultralight backpacks. The market for kids UL-packs is however small, not to say non-existant. Luckily I found a good and cheap solution in France: The Decathlon Diosaz Ultralight runners packs in size 10L and 5L. For around 20-25€ these are good light packs that also come with hydration bladders (They weigh around 250g without bladders.). I'm not very fond of hydration bladders myself, but the kids quite like them. As an added bonus I can use the packs myself for running (It has only happened twice, but it is nice to know the possibility exists.). The shoulder straps are too wide for the kids, but this was easily solved using a carabiner to bring the straps closer together. In the small 5L pack you could just about fit the rain clothes and a fleece jacket. In the 10L pack you could almost fit a sleeping bag (but no fleece-jacket). In hindsight, Filip the 5-year old could have had a larger 15-20L pack. Few questions elicit soo much debate in the lightweight-backpacking area as the question of wet feet. Of course I don't want my children to have wet feet if I can avoid it, but the fact is, you mostly can't. Even with completely waterproof footwear such as rubber boots, the likelihood of water finding it's way in is very large, even close to a certainty. By the way, the same goes for all the kids clothes. In the end we tried both rubber boots and sneakers and both worked. Simon had to switch to his new sneakers since his rubber boots turned out to be too small (It would have been a good idea to try them at him first ; ). Filip is older and it seems already more set in his ways and did not want to try the wet feet concept. I have heard of other parents kids who hike in sneakers. One advantage of doing this is that it can reduce the likelihood of blisters. I would not use normal boots in Scandinavia since they will most certainly get wet the first day and then stay wet the rest of the trip. With bigger kids normal boots might work. An advantage with small kids is that they are small in size too. A roomy two-man shelter can funtion well even with two kids and two adults. I had three choices here: My Bergans Kompakt Light 3, The Tarptent Cloudburst 2 and the Six Moon Designs Lunar Duo. The Bergans was out of the question mainly because of the bulk. If I had chosen it I would have had to switch to my traditional 80L backpack. That would have been a capitulation. The fact that it weighs 3kg is less of a concern on such a short trip, but the total effect of taking it would have been a weight increase of around 3-4kg (+1,6kg for the tent and approximately 2-3kg for the backpack.). The choice between the Cloudburst and the Lunar Duo was harder. Anyone of them would have worked. The Cloudburst is probably better in high winds and it's surface area is very big when lying down, but the ceiling is lower which makes it more awkward to change clothes inside. On the plus side it's less bulky and ca 300g lighter than the Lunar Duo. In the end I chose the Lunar Duo partly because I wanted to test it and mainly because of the higher ceiling. Another factor was that the Lunar Duo fly can be pinned to the ground and thus reduce draft better. I was quite afraid that the kids would be cold in their simple sleeping bags. Compiling the ultimate gear list might seem daunting, but in reality the important thing is to get out there and see what works for you. If you stay reasonably close to civilisation you can always turn back if the trip gets unpleasant. Most of the time with the small kids the challenge has nothing to do with gear, it is managing attitudes (your own, as well as the kids) that's important and difficult. It is however comforting to know that with light gear you can get by without being too overburdened. I would guess that my pack for this overnight trip did not weigh much more than 12kg. Thanks for these posts. I've enjoyed them and will certainly revisit them in the future. You're blazing a trail for me. mMy kids are 18 months and 3 years so it will be a little while yet before they follow me to a wild camp. I admire greatly those who do undertake such trips with little ones. You're right, attitude is hals the battle. On the subject of clothing I'm a big fan of spotty otter: http://www.spottyotter.co.uk We have used a splash suit with Emily since she was very small. It's hard wearing and protective and when she's in it I have total piece of mind. Great article Gustav, not enough of this kind of information out there so I'm sure people with dreams of taking their kids into the hills will really appreciate it. Hi Dave! thanks for your encouraging comments. You have one more difficult year ahead of you, then a short wild camp trip should be within reach I think. Next summer will be a bit tough though. The little one will be just too small to walk long distances, but a bit too heavy to carry. I do not really like the backpack baby carriers for heavier children. I will try to use a Patapum textile one with our youngest instead. It's more comfortable to have them against your back. I guess if you take just your oldest child you could also do a shorter trip now. When it comes to winter skiing trips this year could also be a good one. Rent a pulk (or build one) and you should be able to do some nice day tours. Then the childrens low age could actually prove an advantage. That Spotty otter looks real interesting. Pretty decent prices too. I wonder if they can ship to sweden. We also have only light sleeping bags with a comfort rating of +7 degrees C for the kids. When I suspect that they are not warm enough (when drops below +12 or so) I usually have them wear woollen overalls in addition to the their pyjamas. We have the overalls anyway for them to be used under they winter overalls when it gets really cold in the winter. Now that our oldest is already 7 years old, I might get him a proper down sleeping bag next spring. Let's see. He also carries a 40 liter backpack - only light stuff (sleeping bag, clothes etc.) and not very long distances, but he has not complained really. It is quite soon the kids grow up. If you or someone near you knows how to sew clothes, then that's also a way to get hiking clothes for the kids. It's really good to read your writings when you have been out with the kids, just carry on! Thanks for a very interesting post. In the past my son has used showerproof tracksuit bottoms. I also let him use my ultralight running sack for his pack, which worked well. I was thinking about getting a Golite Pinnacle because when we go together I have to go back to my old heavy weight pack when we camp. Gustav, they certainly ship the the Netherlands. If you can't get your hands on one directly then we can work something out and bounce one via the Netherlands. Glad to hear my blog brings back memories! I hope they were mostly good ones. 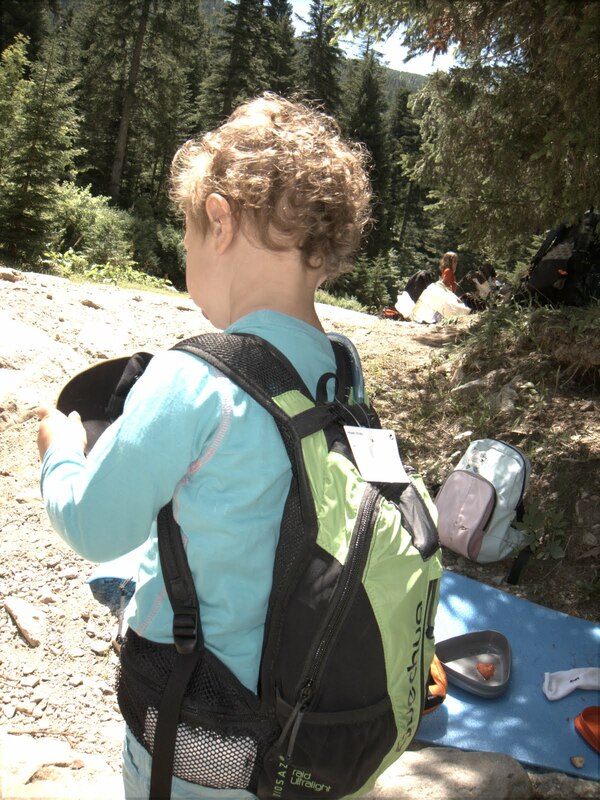 Did you also take your small kids wild camping?